Reb Irving Bunim, the noted askan (community advocate) is buried directly across the road from Rav Shurkin. Where is his FIL, Rav Avroham Kontrowitz, the Chief Rabbi of Newark, NJ buried? Beth Shemesh, moved from the Newark cemetery where he was originally buried. His father-in-law was Reb Yaakov Kanterovitz, father R’ Avrohom. His son is Reb Michel Shurkin from Yerushalayim, a big talmid of R’ J.B. Soloveitchik. There is a beautiful detailed biography of HaGaon HaRav Yaakov Moishe Shurkin zt”l printed at the end of the new edition of “Shiurei Rebbe Yaakov Moishe Shurkin” on Mesechta Baba Kama. His father-in-law was HaGaon HaRav Yaakov Kantorovich zt”l, which those that knew him (including his nephew HaGaon HaRav Moishe Feinstein zt”l) held of him as the Gaon HaDor. He was Rav of Timkavitch in Russia and at the end of his life, when the communist took over Russia, and all rabbonim’s lives were in danger, he and R’ Moishe were of the last Rabbonim to escape to America where HaRav Kantorovich bacame rav of Trenton, NJ. He authored Tzilusa DeShmaatsa on the Shev Shmaatsa, Chidushei HaGR”Y and other seforim. He was originally buried in Trenton. Later on, with a specific psak from his nephew R’ Moishe, the kever was moved to the chelkas harabbonim in Beis Shemesh, E”Y. Rav Avrohom Kantorovitch, mentioned above, was a son of Harav Yaakov and a brother-in-law of HaRav Shurkin. He was a shochet in Mexico who had a strong mesorah of nikkur which he passed down to younger butchers. Every year on both his mother’s yarhtzeit and his father’s yarhtzeit he would make a siyum mesechta, and he was mesayim sha”s. He was active in publishing his father’s seforim and wrote introductions t them. HaGaon HaRav Y. M. Shurkin’s son, HaGaon R’ Michel shlit”a, is also a talmid of his father, HaGaon R’ Moishe, HaG’ R’ Leib Malin and HaG’ R’ Shmuel Charkover zt”l. He is a Rosh Yeshiva in Yeshivas Toras Moishe in ih”k Yerushalim t”v. His father’s full name was Yechiel Michel. Interesting why it’s not on the kever. He learned in Radin for 16 years straight, and was zoiche to be one of the ones who did the tAharah on the heiliger Chofetz Chaim. 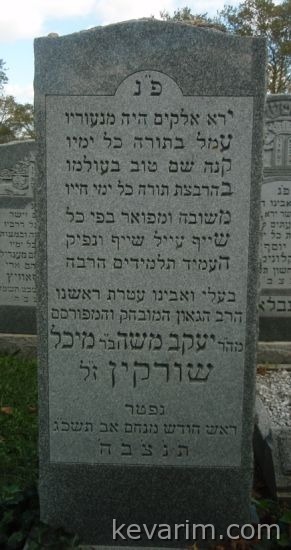 HaGaon R’ Mendel Zaks zt”l (son-in-law of the Chofetz Chaim and Rosh Yeshiva in Radin) wrote the nusach of this matzeivah of Hagaon Harav Shurkin zt”l. They were very close. Interesting – they were cousins, born in the same small hamlet Podobranka deep in White Russia over 100 years ago, and endend up having kevorim on the other side of the world not to far from each other! You will need to point out which Rebbe you are reffering to (I think you are talking about Lubavitch but not 100 % Sure). Hagaon Rav YM was the younger son of R. Michel and Chaya Henya Shur, a scion of a prominent chabad family in Podobranka (R. YM had it changed at a later date, most likely to evade the Russian military draft). His mothers father was R. Zalman Freidin who in turn was the son in law of R. Zalman Chaikin of Podobranka. R. Levi Yitzchak Schneersohn was a grandson of the aforementioned R. Zalman Chaikin as well. He and R. YM’s mother were first cousins. His son, the Lubavitcher Rebbe and R. YM were second cousins. Small correction to 11: The Rebbe was born in Nikolayev, it was his father HaRav Levi Yitzchok ZT”L who was born in Podobranka. Where can this letter referring to HaRav Shurkin be seen? I have never seen it before, plus as i wrote, while he was a relative, he was not ben-iro. – Rav Avrohom Kantorovitch, mentioned above, was a son of Harav Yaakov and a brother-in-law of HaRav Shurkin. He was a baki b’Sha”s and also could recite the entire siddur baal peh. He worked as a typesetter of seforim, including his father’s “Chidushei Hagr”Y and the seforim of his first-cousin Maran Hagaon R’ Moishe Feinstein. He lived a quiet erhlicher life with his wife in Boro Park. They did not have children. – The comment above applies to R’ Avrohom’s brother, R’ Hertzel Kantorovich z”l (another son of Hagaon R’ Yaakov Kantorovich z”l and brother-in-law of Harav Shurkin z”l) – Harav Hertzel Kantorovich z”l was a shochet in Mexico who had a strong mesorah of nikkur which he passed down to younger butchers. Every year on both his mother’s yarhtzeit and his father’s yarhtzeit he would make a siyum mesechta, and he was mesayim sha”s. He was active in publishing his father’s seforim and wrote introductions to them.